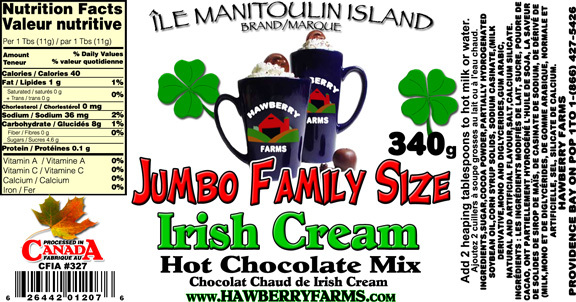 Click the button below to add the Irish Cream Hot Chocolate Family Size to your wish list. Family Size Hot Chocolate! Irish Cream! Add two tablespoons to hot water or milk! Ingredients: Modified milk ingredients, sugar, cocoa powder, partially hydrogenated soybean oilcorn syrup solids, sodium casinate, (milk Derivative, mono and diglycerides, gum arabic, natural and artificial flavour, salt, calcium silicate.